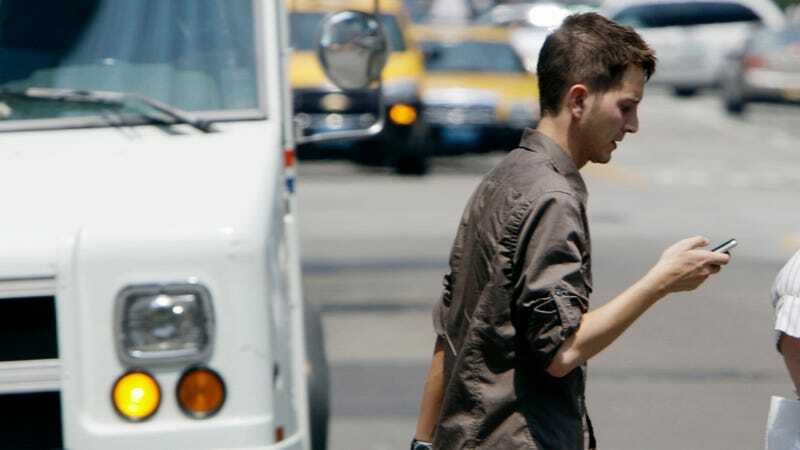 Make a mental note if you’re visiting Hawaii soon: Starting Wednesday, texting while walking across a street in Honolulu is illegal, thanks to a new law that allows police to fine pedestrians up to $35 for checking their phone, while crossing an intersection in the Hawaiian city and surrounding county, according to the New York Times. That’s right—while walking. Honolulu is believed to be the first major city with such a ban, the Times reports, and city officials are pumped about it. “This is really milestone legislation that sets the bar high for safety,” said Brandon Elefante, a City Council member who proposed the bill, in an interview with the Times. One of the reasons behind the push? Pedestrian deaths jumped nearly 10 percent in 2016, up to roughly 6,000. The Times reports that’s the highest rate since 1990—but it’s ultimately inconclusive, for now, whether pedestrian deaths can be linked to texting while walking. One reason may be the sharp rise in smartphone use, “a frequent source of mental and visual distraction” for both drivers and walkers, a report by the Governors Highway Safety Association found. “I’m guilty myself,” said Charles Chan Massey, chief executive of SynaxisMeetings & Events, a management firm, who uses the time walking to and from meetings and business lunches to catch up on calls, texts and emails. Honolulu’s feat has been attempted elsewhere, mostly to no avail, according to our sister site Gizmodo. Cities in several states have tried passing similar ordinances, but Fort Lee, New Jersey, succeeded, in 2012. The Idaho city of Rexburg, pop. 35,000, adopted a ban a year prior, reports the Times, after it recorded five pedestrian deaths in a quick timespan. Regardless, we’ll now have a test case in a major city to review. The law, which you can review here, calls for fines ranging from $15-35 for first-time offenders; after a third violation, a fine as high as $99 can be levied.